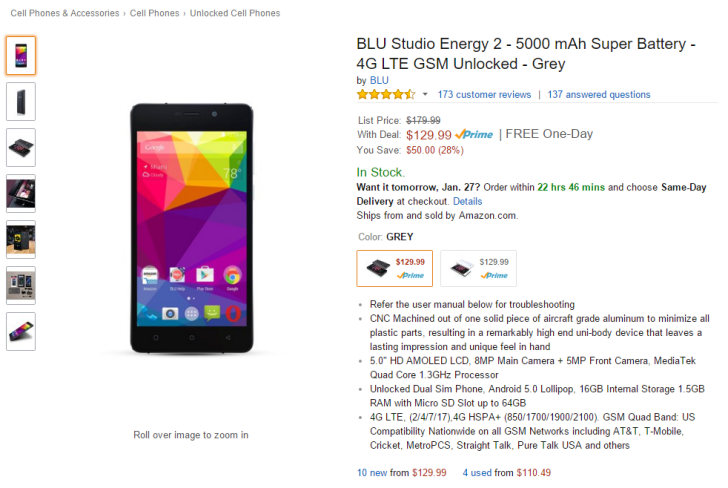 If battery life is the most important factor of a new phone purchase, there's probably no better bang for the buck than the BLU Studio Energy 2, even at its normal price. Cameron gave it a decent recommendation in his hands-on post a couple of months ago. Shoppers who are in the market for a mid-range phone that lasts more or less forever can pick it up from Amazon with a significant discount. The phone's price dropped by $50, bringing the total down to an impressive $129.99. Naturally, it comes with Amazon Prime free shipping. The Studio Energy 2's standout feature is its gi-freakin'-normous 5000mAh battery, bigger than just about any phone from more mainstream manufacturers. The rest of the specs are decidedly low-end: the 5" AMOLED screen is just 720p, a Mediatek 1.3GHz processor and 1.5GB of RAM aren't going to set any speed records, and the 16GB storage is nothing to write home about, so it's a good thing the phone has a MicroSD card slot. The radio works with most GSM 3G and LTE bands, cameras are 8MP on the rear and 5MP on the front, and it's running Android 5.0. Don't expect an upgrade any time soon. Both black and white versions are available at the lower price. Even so, the low price and longevity make the Studio Energy an excellent backup device, especially if you're travelling. This deal isn't marked as a sale and doesn't require any coupons, so the price reduction might just be permanent. On the chance that it's not, I'd get an order in quickly.